A giant illuminated sound UFO landed during summer 2015 in the context of the international exhibition Globale in Karlsruhe asking how the ancient music of the spheres might sound like in the age of astrophysics of the 21st century. 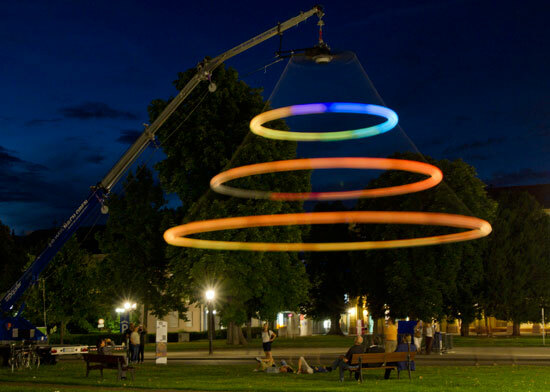 The Heaven's Carousel is based on an ethereal carousel construction with 36 illuminated loudspeaker spheres hanging from a trailer crane ten meters high on the Friedrichsplatz in front of the Museum of Natural History. The spherical loudspeakers are mounted on strings and turning around the heads of the visitors spanning up to 16 meters at full speed. In occasion of the 300 year jubilee of the city of Karlsruhe and its special exhibition The City is the Star – Art at the Construction Site the sound universe will spin every night after sunset from 19 June – 9 August. The Heaven’s Carousel creates a mesmerizing organ like sound effect touching everybody who is moving around under the rotating spheres. In the end, the Heaven’s Carousel is a new microtonal instrument echoing important discoveries as the accelerated expansion of the Universe. For the expanding sound installation acceleration plays a crucial rule as the pitches of the pure tones played by the speakers change with the velocity and the position of the visitor. Due to the Doppler effect the tones sound higher when they are approaching and deeper when they are departing. Consequently the sounds recompose differently in each place weaving an oscillating organ like sound carpet. The clue is that the Doppler-effect is almost zero in the center of the installation, but it unfolds the more the visitor moves outwards. The illumination of the loudspeakers completes this universal art work indicating by its light and spectral colour the activity and played pitch of a speaker. The Heaven’s Carousel is the result of an extraordinary collaboration with Hubble Space Telescope. It premiered 2014 in the palm garden of the Accademia dei Lincei in Rome. It was finally the generous support by the European Space Agency (ESA) making this project happen. The Nobel laureate in physics Adam Riess, who inaugurated the presentations in Rome and in Baltimore, is excited about the project. For him important cosmological discoveries, as the accelerated expansion of the Universe, are echoed in the piece, translating light phenomena into acoustics. Thus astrophysics becomes a very special sound and space experience. Tim Otto Roth understands the Heaven‘s Carousel primarily as new instrument inspiring to mictrotonal compositions. Here he plays with the mathematical ratios of Hydrogen spectra or the 31 tone scale developed by the Dutch mathematician and astronomer Christiaan Huygens in the 17th century.